If one individual is to be singled out for representing the values and traditions of India from the ancient times to the modern age, it cannot be any one other than Rabindranath Tagore (1861-1941). He was the one person who incorporated the wisdom of the past, reflected in the spiritual and intellectual attainments of the Vedas and the Upanishads. Yet, he was never so immersed in India's seemingly other-worldly heritage, underlined in the philosophical concept of the world being an illusion (maya), as to negate rationalism. To use a cliché, he combined the best of both worlds. Tagore scored in this respect over his other great contemporary, Mahatma Gandhi, for the Mahatma placed a far greater emphasis on the spirit of renunciation marking a rejection of the Western industrial civilization. To a large extent, it is this attitude extolling the 'simple living, high thinking' outlook that is still favored in India, even if it is not infrequently identified with hypocrisy. Tagore set his face against such a rule of thumb approach to life if only because his horizon was much wider than Gandhi's. He had no time for Gandhi's rejection of European machines and preference for primitive Indian ones like the 'charkha', or the spinning wheel. "If a man is stunted by big machines", Tagore wrote, "the danger of being stunted by small machines must not be lost sight of. The charkha in its proper place can do no harm ... but where ... it is in the wrong place, then the thread can only be spun at the cost of a great deal of the mind itself. The man is no less valuable than the cotton thread." Poet, thinker, playwright, novelist, writer of short stories, dance dramas and songs, painter and educationist - Tagore's versatility was matched only by his genius. Truly, he was Gurudev, the epitome of the preceptor idealized in Indian myths and folklore. Not surprisingly, Gandhi bestowed the title on Tagore - an honor that befits him even today - just as Tagore called Gandhi the Mahatma, recognizing the sterling qualities of a saint in the politician, who is embroiled in the heat and dust of quotidian battles. It was left to Nehru to say that although Tagore and Gandhi were "entirely different from each other, and yet both of them (were) typical of India, both in the long line of India's great men". If Tagore's legacy remains as relevant today as it was in his time, the reason is that he cherished certain ideals that have come to distinguish India in the present-day world. Hence, perhaps, the statues, busts and university chairs named after him which dot the world. The first and foremost concept of Indian nationhood that he lauded was its inclusiveness. He recounts in one of his poems how the streams of Aryans, non-Aryans, Sakas, Huns, Pathans, Mughals et al have merged to give India its distinctive identity. It is not impossible that he developed this concept from a study of his own family, which he regarded as a product of the "confluence of three cultures, Hindu, Mohammedan and British". It is this ideal of an integrated and vibrant multicultural society, a rainbow nation, which India holds up today as the only valid model which can ensure the survival and advancement of all. Otherwise, the so-called civilizational clashes between ethnic, religious and linguistic groups will tear the world apart. It is perhaps just as well that the great man died before India itself fell prey in 1947 to one such murderous conflict based on religion. And, then, the broken nation saw another divisive conflict in 1971 based on language and sub-nationalism, which led to the creation of Bangladesh. Tagore would probably have been even more mortified by the second rupture because he came from that part of the subcontinent - East Bengal. In his time, he witnessed the colonial rulers partition Bengal in 1905, a traumatic upheaval for his Sonar Bangla. Fittingly, it is his song of love and reverence for the land where he was born (Amar Sonar Bangla) which is now the national anthem of Bangladesh. Tagore recognized the seeds of the conflicts that tore apart India in Gandhi's use of religious symbols, both Hindu and Muslim as in the concept of Ram Rajya and the exhortation in favor of the Caliphate. He was as opposed to Gandhi's love for "small machines", with their numbing effect on the mind, as to his idealization of religious emblems, which can exert an equally stifling impact on the largely illiterate masses. "I blamed Mahatmaji", Tagore wrote, "for exploiting (the) irrational force of credulity in our people." While Gandhi defended the Hindu idols, as the English clergyman and admirer of India C.F. Andrews recalled, "believing the masses (to be) incapable of raising themselves immediately to abstract ideals", Tagore could not "bear to see the people eternally treated as a child". 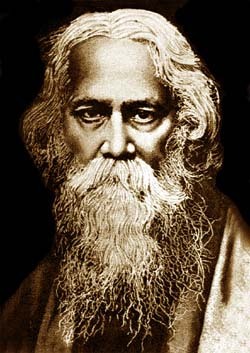 Many will see Tagore's depiction of the crafty politician mouthing nationalistic slogans to mobilize the credulous in his novel Gharey Bairey as a mirror image of the present political scene, just as his prescient vision that a revolution devours its own children, as in Char Adhyay, will be appreciated today although it was written in the context of the much-lionized anti-British revolutionaries and anarchists of his time. Tagore wasn't without his critics at home and abroad. Even while accepting the Nobel Prize for Literature in 1913, he referred to the "calumnies and insults" he had received from his countrymen. The West, too, lost its interest soon enough. Graham Greene thought in 1937 "I cannot believe that anyone but Mr Yeats can still take his (Tagore's) poems very seriously". And Yeats himself had come to the conclusion by then that Tagore wrote "sentimental rubbish". Notwithstanding these ups and downs, as in the life of all individuals, big and small, Tagore's thinking had a stamp of modernity which can act as guideposts for India and the world - just as his song, "Ekla Chalo Re" (walk alone), inspired Gandhi during the communal violence of 1946-47. And nowhere is Tagore's modern outlook more evident than in his paintings, with their remarkable stark originality, quite in contrast to the mellifluous nature of his verse. Perhaps more than any other aspect of his vast artistic output, it is in his paintings that apparently depict his real self - "I am by nature a savage" - that Tagore will live for generations.